This year, I unfortunately did not complete many DIY projects for my Christmas gifts, even though I love putting time and effort into them when I can. But, one special gift I’d like to share with you is the bag full of goodies I gave to my mom. My mom has been (and continues to be) a big help since I got pregnant. From painting the nursery to the promise of help in the future when Maggie arrives, Mom has been a trooper in the help department. I know she’s just as excited as I am about this first birth, so to celebrate that and to thank her for her support, my big Christmas gift to her this year was a little special: a “Gram Bag” of goodies to help her be the best Gram she can be! 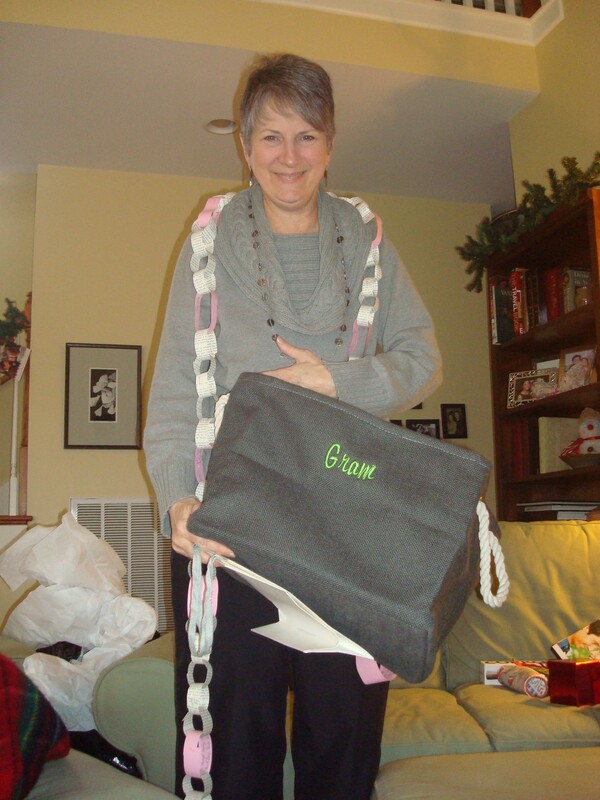 The bag was embroidered with her “grandma name” and included supplies that she’ll need to be a grandmother. She can use the bag each time she sees Maggie, using it to hold all of her tricks and fun grandmother things. If Mom didn’t have hearing aids, I would have given her ear-plugs, but she’s fine in that department! One other added element was a Countdown Chain until Maggie’s arrival. Kind of like an Advent Tree of sorts, Mom can tear away a loop from the Countdown Chain on each day until Maggie’s due date. 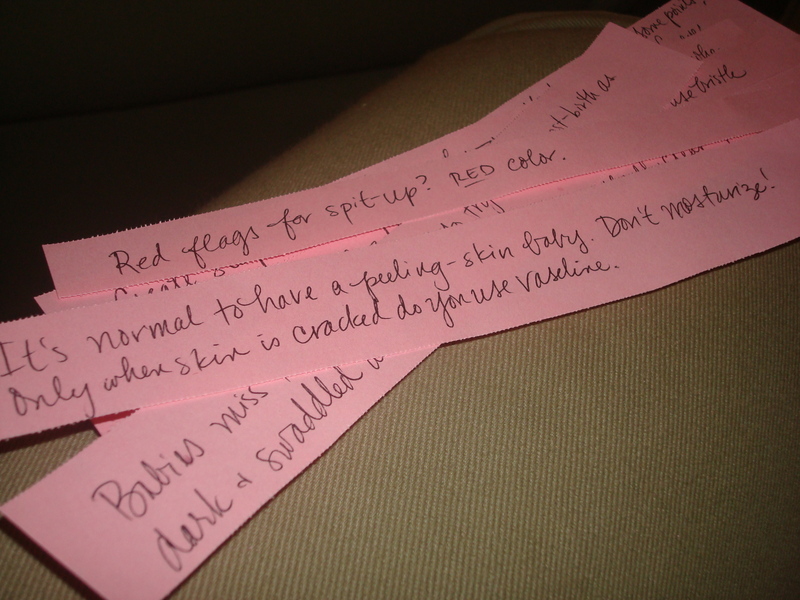 The gray loops are just fun old pages from a previous project, but on the pink loops, there are tips on newborn care. Thankfully, my mom doesn’t have the attitude, “I know exactly what to do when this baby arrives!” I know this because after telling her I went to a “Newborn Care” class, she said, “Did you take notes? I want to read all of your notes!” I love that about her. So, I added some tips that I recently learned to the Countdown Chain so she’s be totally prepared for helping me in those first few days after Maggie is born. Not exactly a DIY project but it’s a gift that required a little more thought and a bit more love. There will be lots of “firsts” for Gram, but this gets her there with more anticipation and fun facts!